This book presents work that has been conducted as part of the research project "Discourse on ethical questions of biomedicine" of the interdisciplinary Working Group Bioethics and Science Communication at the Max-Delbrueck-Center for Molecular Medicine (MDC)in Berlin-Buch, Germany. This book offers ground-breaking ideas on how the daily interworking of cutting-edge biomedical research assess the broader social context and its communication to stakeholders and the public. Editors cover three aspects: Scientific, Ethical and Legal, and Perception and Communication. 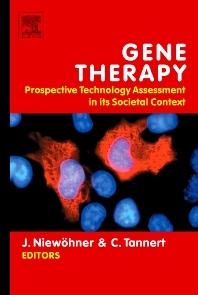 This work establishes an international and interdisciplinary network of excellent researchers at the beginning of their careers, who brilliantly integrate their work into the different perspectives on gene therapy from the natural and social sciences, as well as the humanities and law. Addresses such questions as: Does patent granting hinder the development of Gene Therapy products? Practicing scientists, graduate students, academic clinicians who want to understand more about the ethical issues of gene therapy.